Having just read Pacific Power. Australia’s Strategy in the Pacific Islands, (Author: Joanne Wallis) this book is an excellent read, and anyone interested in International Relations, especially the Asia-Pacific (A-P), should indulge in this succinct and articulate analysis. One thing that I found particularly disturbing and of profound significance to Australia’s future was that ‘reflecting on Australia’s benign neglect of the Pacific Islands during the 1970s and 1980s,’ (p92), with the rise of China — and its inherent and continual geo-strategic push throughout the A-P (which is what, as I have previously stipulated, is what rising powers seek to achieve) — Papua New Guinea (PNG) has an agreement with Australia: Joint Declaration of Principles (1987). 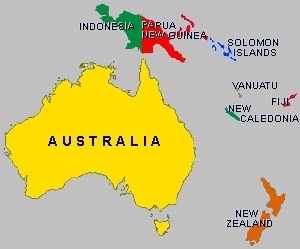 What is most amazing about this agreement and according to Wallis is that if Indonesian military forces intrude into PNG in order to prosecute a mission –such as seeking refugees escaping from West Papua/Irian Jaya–is that in the process if they come into contact with PNG military forces. What does this mean for Australia? According to Wallis ‘Australia may be obliged to assist PNG forces in such a conflict, which would place Australia in direct military conflict with Indonesia …’ (p316). As China rises and its ties get closer with Indonesia and the Chinese government formulates and then develops further pacts with its A-P alliances, such an encounter could be used as a trigger for China to move on its Australian assets (such as the Port of Darwin), in order to proffer its geo-strategic footprint in the region; and exert greater authority over the region per se. Yet another issue for Australia to consider in the future as the submarine debacle continues; Australia cuts foreign aid to its nearest neighbours which will inevitably have a backlash; and the political-memory of World War Two remains vibrant due to the ‘saving of Australia’ by the United States of America (US), from which Australian politicians’ seem totally incapable of extracting their collective-selves from. If China utilizes such an action and then extends upon it, the repercussions for Australia could be immense. In the introduction to the chapters Wallis also alludes to the voting in of Trump and the repercussions for the A-P that may happen due to this. Notwithstanding all of the aforementioned it is a very interesting read and one that is thoroughly recommended for those interested in International Relations. This entry was posted in Asia-Pacific Politics, Asian Century Politics, Australian politics, Indonesia, international relations, Papua New Guinea, Rise of China, Uncategorized, war and tagged Asia-pacific, Asia-pacific region, China, Indonesia, international politics, Papua New Guinea, politics, war. Bookmark the permalink.